Removes buildup of dirt, grime and other deposits. BBJ evaporator coil cleaner will not etch, pit or corrode metal. It is safe for use on all metals, including copper and aluminum. Power Coil Clean is non-caustic and non-corrosive. Unlike other cleaners that rely on a chemical reaction between the cleaning agents and the metal coils, Power Coil Clean utilizes powerful surfactants in combination with patented Enviro-Guard encapsulant to leave coils clean and shiny with no damage. Its fast penetrating action quickly flows to even the hardest to reach areas. Will not stain or bleach materials or fabrics. Available in the a variety of sizes. Safe for all metals, including aluminum Will not etch metal. Some acid coil cleaners can etch the metal surfaces causing water blow off on the evaporator coil, which in turn can cause microbial contamination downstream. Contains BBJ Enviro-Gard Regulates the proven cleaning power of ammonium bifluoride without generating harmful biproducts. Non-Caustic, Non- Corrosive May be used on both indoor evaporator coils and outdoor condenser coils. Safe disposal Environmentally friendly. No special handling of used containers after rinsing. No special equipment needed Saves money on costly equipment. May be used with just a pump-up sprayer. Comes in a highly concentrated form Reduces the costs of shipping and storage. Can be mixed in a wide range of different strengths. No need to evacuate premises No harsh odors. Allows for the use of the product during normal business hours. Non-caustic heavy-duty coil cleaner that is safe for all metals. Q: Why is Power Coil Clean so effective? 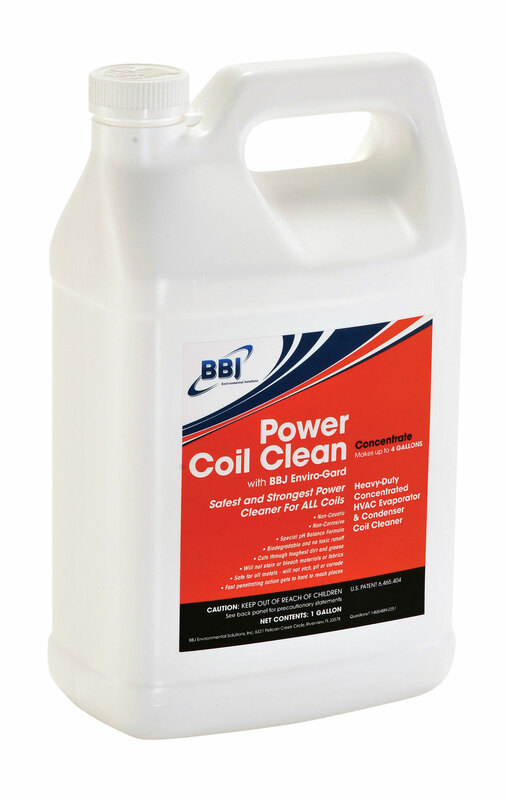 BBJ's Power Coil Clean, with BBJ Enviro-Gard, safely removes the most stubborn soils and deposits on evaporator coils, condensor coils, and other dirty HVAC/R components, without damaging metal surfaces. This buildup interferes with proper system operations and supports the growth of harmful bacteria and fungi. Power Coil Clean removes accumulated buildup and restores operating efficiency. Q: Is Power Coil Clean corrosive or caustic? Power Coil Clean contains specialized surfactants that are not corrosive or caustic. 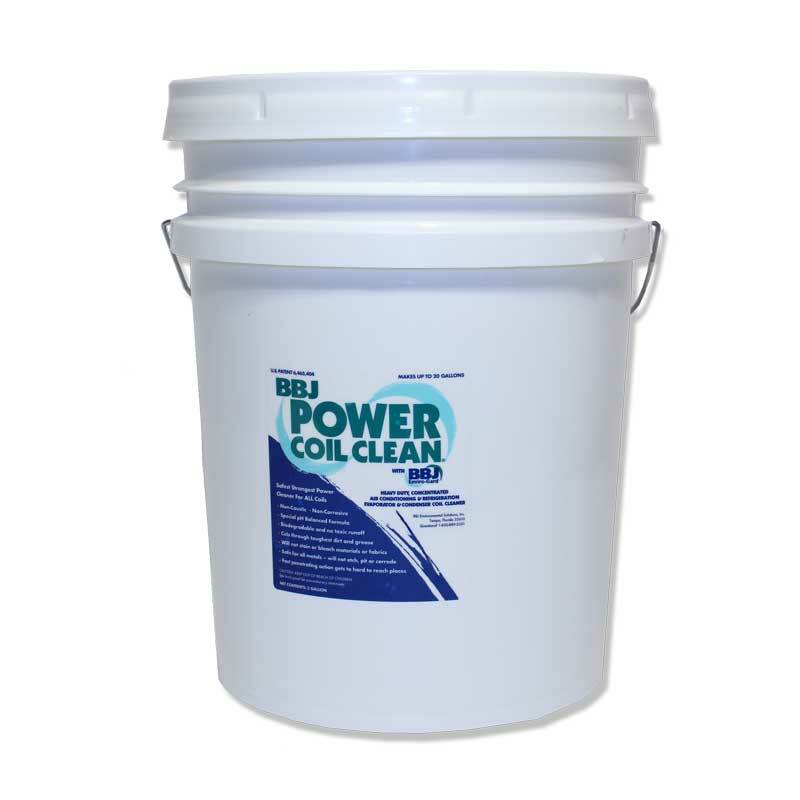 Power Coil Clean contains BBJ Enviro-Gard, an encapsulation control agent that regulates the proven cleaning power of ammonium bifluoride without generating harmful byproducts. This revolutionary patented technology allows Power Coil Clean to clean like an acid, but without damaging the equipment.